Scent Company has been appointed by Armani for a tailor-made project of Scent Marketing & Olfactive Branding services for the Armani Hotel in Dubai. What is Olfactive Branding for Luxury Hotels? Olfactory branding is a branding strategy consisting in the creation of unique personalized fragrances aimed at enhancing the Brand’s image, engagement and mission inside the luxury Hotel. Among the variety of marketing strategies and tools available for Luxury Hotels , the concept of olfactory branding has been developed and brought to a higher level by Scent Company, with a complete offer of products and services aimed at creating multisensory engagement between the Brand and its clients. Scent Marketing & Olfactive Branding are nowadays the latest branding frontier and in the World of Luxury Hotels are able to bring the emotional experience inside the location to a higher level of engagement. Unique and personalized scents have the power of transporting us through place and time, thus creating the perfect olfactory environment. How Scent Company designed the Olfactory Logo and the Olfactory Architecture for the Hotel Armani Dubai? Each client is “unique” for Scent company and every time the company starts over in a new process of creating a fragrance and a scent marketing service that is tailor-made for the customer. In the olfactory branding and scent marketing fields, you must have more than a talent for knowing what fragrance is the right one. You must be able to make a studied proposal as to which scent can truly represent Brand personality, by interpreting materials and signs, brand history, concepts and feelings. Scent Company first of all established a deep relationship with Armani Management, to choose the matching olfactory logo. The choice of the magical combination of natural fragrances was made by taking into account a variety of aspects, primarily brand image and brand history, but also the type of the area to be scented, as well as lighting and furniture. Above all, the choice involved the set of emotions and experiences linked to the Brand and the Hotel, in order to bond with guests by surrounding them with objects and sensations that transmit pleasure, wellness and harmony. The task of creating a unique brand fragrance is similar to the task of creating images and sensations. As in the World of Fashion, scents involve attitudes, seasons, colours, trends, times, contexts and experiences. There is a time and a place for everything. In base of Armani Hotel Dubai Brand Image and places to be scented, Scent Company designed various fragrance samples and formulations to be tasted and to be elaborated together with Armani management. After some weeks of research and experimentation, Scent Company designed the personalized Olfactory Logo for Armani Hotel Dubai. The scent uses deep incense notes (a kind of earthy, leathery, and comfortable but still very chic scent) enriched with a bright red berry note. The result is a seductive scent really representing the elegance of Armani’s Style. The fragrance is natural and water-based and safeguards environment and health. It is important to catch the right delivery method to diffuse the olfactory logo in order to appreciate the depth of a custom fragrance. Scent Company uses scenting system machines which are hidden and directly connected to the HVAC system of the Hotels. The result is a soft, invisible and pleasantly persistent scenting. Scent Diffusers branded Enjoy Remotes have been connected to the HVAC system of Armani Hotel Dubai in order to spread the brandwide fragrance in all the public areas like the lobby, the reception, the main entrance, the bar, the relaxing area, the meeting rooms, the lifts and the SPA. Enjoy Remote is an essence nebulizer, available in four models, that cover a range of different spaces. It is possible to control the system by tablet or smartphone in order to modify the perfume intensity or the functioning times and to be informed of any possible faults. Scent Company took a step further, incorporating the personalized formulated scent into room & linen sprays for guest rooms and bathrooms, candles, home fragrances, rattan stick diffusers, wardrobe fresheners and sticks. This was to capture the emotions of Armani Hotel Dubai fragrance and transform it into elegant pieces of scented home décor and accessories and in order to diffuse the olfactory logo also in the single hotel rooms. 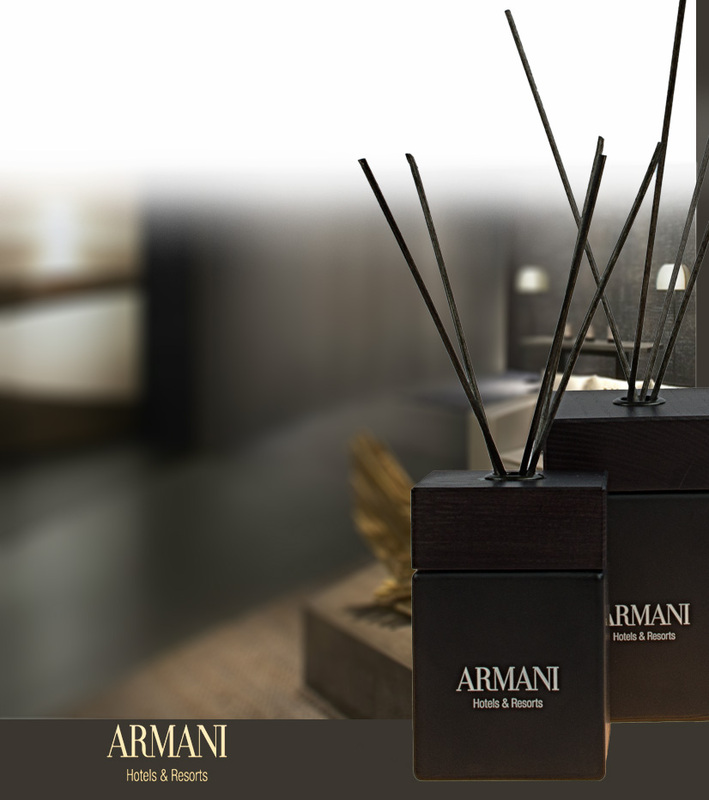 Guests of Armani Hotel Dubai have also the possibility to buy at the reception area the hotel scented décor. Scent Company completed the offer with a very high quality cosmetic and accessory line dedicated to personal care. An essential detail for those who are constantly in search for excellence. By embodying the fragrance chosen by the hotel, the products of the courtesy line reinforce the olfactory logo and represent a refined detail by which to be remembered and that the guests wish to carry home. Scent Company is a fast-moving Italian Company specialized in the design of personalized olfactory logos and projecting olfactive branding & scent marketing services for luxury hotels, Spas, high-end retailers, corporate clients, and even private villas. Scent Company creates a synthesis of art and craft, Italian tradition and innovation in order to meet the increasingly sophisticated customers’ needs, who recognise innovation and quality, and are always on the lookout for originality.